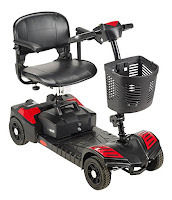 The 3 Wheel Drive Medical Scout Compact Travel Power Mobility Scooter SFSCOUT3 is similar in features and specifications to the SFSCOUT4 except with 3 wheels instead of 4. The SFSCOUT3 is slightly lighter than the SFSCOUT4 and its 3 wheels give it a shorter turning radius of 45.5” compared to the 53.75” of the 4-wheel version. Both mobility scooters are suitable for both indoor and outdoor use, but the 3-wheel version is specially designed for nimble indoor navigation thanks to its shorter turning radius. The compact Drive Medical Scout 3 Wheel Mobility Scooter is designed to be quickly and easily taken apart – it disassembles into 5 manageable pieces - so you can easily fit it in the trunk of your car to transport it wherever you need to go. 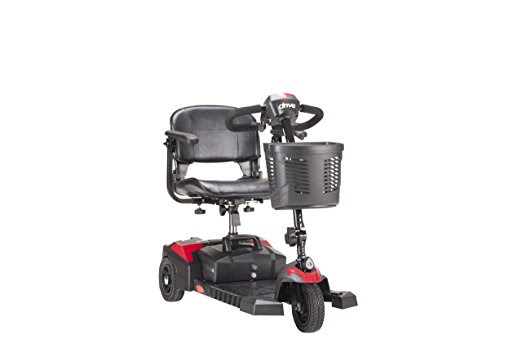 Ergonomic and comfort features of the Drive Medical Scout 3 Wheel Mobility Scooter include a height-adjustable and swivel-lockable padded seat with padded backrest and angle-adjustable and width-adjustable padded armrests. The Scout 3’s tiller is also angle-adjustable for easy reach of the delta-shaped steering handle and control panel. The wrap-around design of the steering handle allows for effortless driving for people with limited strength or dexterity. 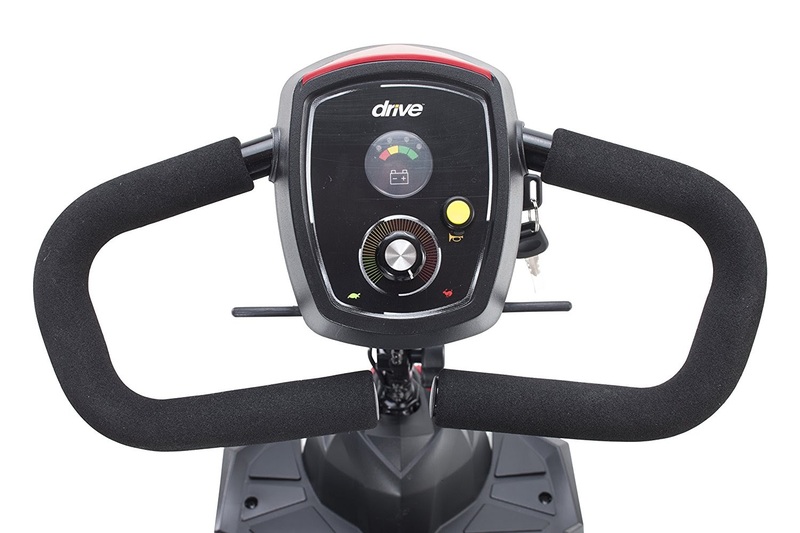 The Drive Medical Scout 3 Wheel Scooter’s control panel is straightforward and easy to use, featuring a speed dial, throttle, horn button, battery indicator, key and key switch. It offers variable speed range up to 4.25 mph and a distance range up to 9 miles (on a single charge). For safe stopping on the SFSCOUT3, simply release the throttle and the scooter will come to a stop using electromagnetic brakes. Once the scooter is at a complete stop, the scooter’s park brakes will automatically lock the wheels. The Drive Medical Scout 3 Wheel Mobility Scooter utilizes a 24V 270W 4700rpm motor and comes with a quick-connect rechargeable 12Ah battery pack and 1A Offboard charger. Additional features of the Drive Medical SFSCOUT3 Mobility Scooter include 8x2” non-marking flat-free anti-tip wheels, 2.5” ground clearance, 6 degree climbing angle, front-wheel lock, forward and reverse operation, manual operation option, interchangeable blue and red colored panels, and a 300 lb user weight capacity.